Nadcap welding is an exceptionally clean and uniform process used in aerospace and other government association contract manufacturing projects. Nadcap-certified processes use premium metals like argon due to their higher purity and corrosion-resistance properties. The results include improved supplier quality, reduced operational costs and higher quality production overall. Axenics holds the D 17.1 Nadcap Welding Certification in accordance with National Aerospace and Defense Contractors Accreditation Program (Nadcap) standards. Of the many certifications that contract manufacturing companies hold, Nadcap is one of the most highly coveted. In order to receive Nadcap accreditation, suppliers must undergo a strict and detailed auditing process. Before a company can be audited for Nadcap accreditation, it must first be AS9100-certified (the Aerospace Manufacturing Standard). Although Nadcap accreditation was originally established as a means of standardizing quality assurance measures for the aerospace and defense industries, the accreditation has become a symbol of excellence across the board. Our certified staff is capable of welding and testing to customer specifications and/or certifications upon request. Axenics’ Nadcap accreditation assures our commercial and military aerospace customers that Axenics is sufficiently equipped to produce quality material for Tier One, Tier Two and/or Tier Three suppliers, maintaining the high standards set forth by the industry. As a result of Nadcap, manufacturers and suppliers in the industry have seen a decrease in the number of audits per year and an overall increase in quality. In fact, according to PRI, “85% of Nadcap accredited companies report a measured improvement in quality as a result of being Nadcap accredited.” Axenics is proud to hold the D 17.1 Nadcap Welding Certification. Axenics offers Nadcap argon welding services for everything from engines, air frames and landing gear to missile systems and space vehicles, and everything in between. Our certified staff is capable of welding 300-series stainless steel and Inconel 625, performing Nadcap-certified welds that range in size from ¼-inch to 4-inch welds and beyond. Axenics performs argon welding for simple welds, complex assemblies, machine components and small-diameter tubes. Each step of the process is documented for trace-ability and accountability by every person who comes into contact with the metals, from start to finish. By using a traceable process, metals can be traced back to their mill of origin so that the precise chemical makeup of each metal is known. To request a copy of our Nadcap certificate, please email sales@axenics.com. At Axenics, welding is the core of how we got started and what we do. Our welders are specially trained to execute a variety of welding techniques to create the desired secure joint for our clients based upon their specifications. Three such welding techniques are freehand, autogenous and cup walking. Freehand weld methods are suitable for small weldments or welds that might be in a different shape such as in a square or when it needs to be flat. Autogenous welding techniques also are used for small welds and are desired when the pipes or joints are joined without using filler material. Cup walking is a preferred method for pipes that are larger in diameter so that the weldments look consistent. 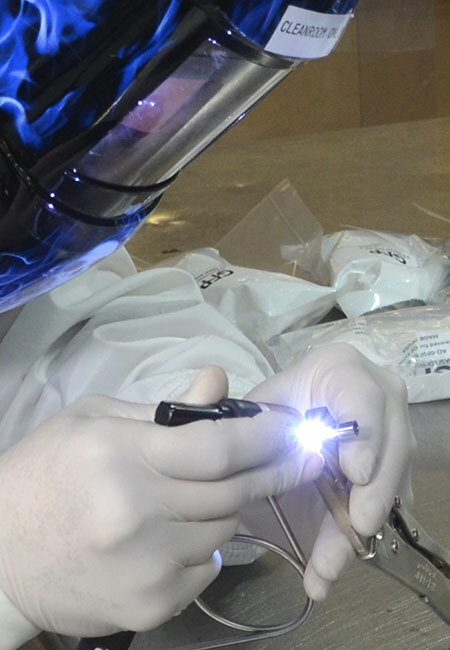 At Axenics, we maintain a Class 100 Cleanroom, and our technicians use ultra-high-purity argon, allowing us to maintain the cleanest welds in the industry. This allows us to perform cleanroom assemblies for industries and projects where it is required. All of our products are carefully inspected and helium leak-tested before leaving our facilities to ensure they meet or exceed customer expectations. Are you in need of Nadcap welding services for your next project? Contact Axenics to find out how we can help provide certified solutions to your business needs.